My idea was to make an Mayan themed case. I'm sorry if my Mayan/Aztec/Olmec references may get mashed together at points. I'm busy studying the various points of all of them and I'll try not to mess that up. 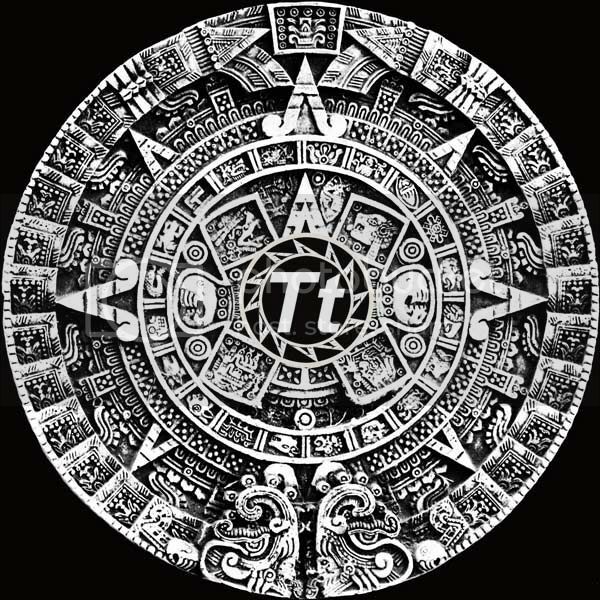 But for all intents and purposes it should be classified as Mayan based since the HUGE calendar is going to be on the one side. Some of the ideas are really straightforward, stone textured/colored. Moss in the cracks and vines and what not. Some of this stuff I can get at a local train/plane/miniatures type hobby shop. I will have to go with a Balsa foam sculpting medium that I really like the idea of. It will easily translate into looking like a stone material, and be light as heck. The glue and the paint on it will probably end up weighing more than the material itself. Unless I can make it some kind of a cave/mouth/opening. That will have to come when I get the case in my face. 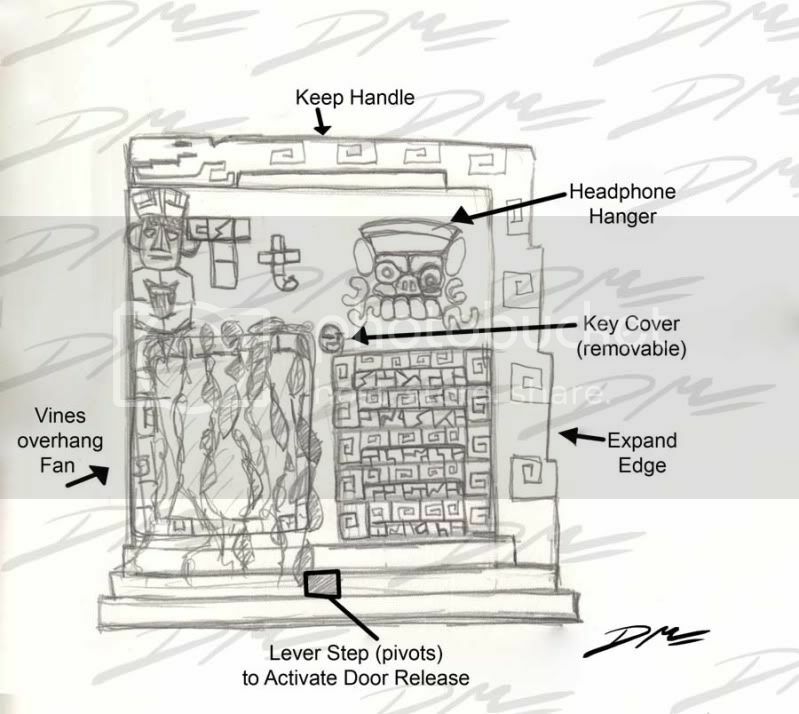 Like I mentioned on my original submission, the release for the door may be somewhat modified from my drawing. I may just make it part of the ruins and make it accessible to a finger to press on it. I think the key areas may be easily hidden behind some special &#34;stone&#34; that is removable, maybe with an embedded magnet to keep them in place. I do still want to wholly contain this rig's functionality/versatility by keeping the front slots, perhaps modifying the location of some of the buttons or omitting them as needed is all. And I think having the headphone hanger still available but a large sculpted item would also be a nice touch. 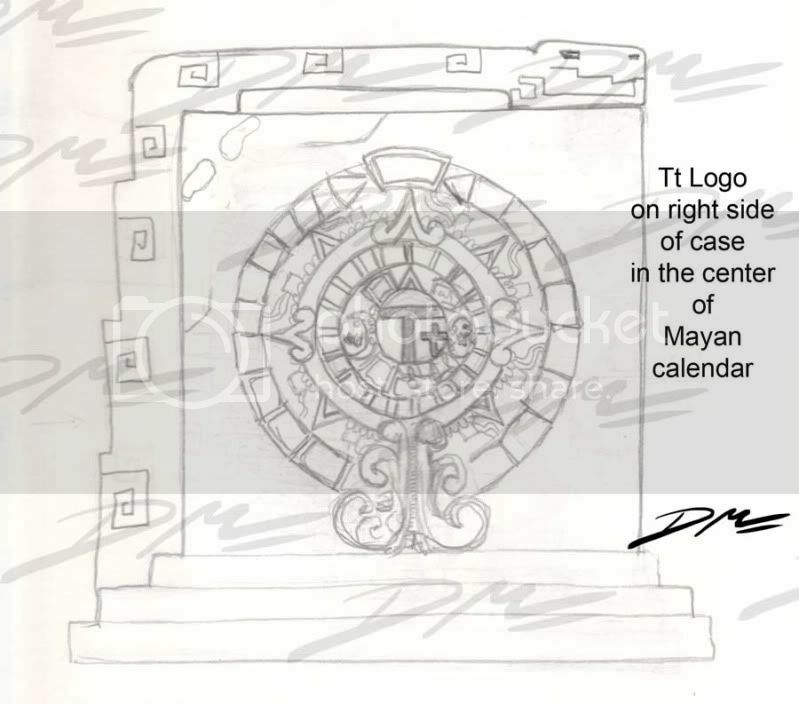 but will you have to redo this case in 2012 when the Mayan calendar ends? Well im glad if we are to use it we will at least have a year with it as it looks like it will turn out awesome! Ha ha ha. Well maybe we can find a Myan and ask them if they could possibly extend the calendar a few months perhaps? I mean it can't end when there's another Quake Con planned. Silicone vines? That would be very cool . Will also be a little more flexible than plastic so it wouldn't deflect as much air either . I actually talked to a Mayan when I went to Cozumel and he said it's all a bunch of BS. The only reason the calendar is ending is because the ancestors that were doing it only designed it up until that date. Then nobody worked on it for so long that it was forgotten. They just didn't see any importance in it anymore since we go by the current system. So what you're saying is that someone can mod the calendar? Take an old out-dated calendar and make it awesome? Sending out the call for Mayan modders! quick update, little bit of the gimp photoshop skills. Oh well, here you go. I hope it to look a little something like this. And I am considering carving the Level 10 GT back into place on the lower right side as well. Totally appropriate. I'll have to see if I can find Tt logos in Egyptian hieroglyphics. It would prove positive that Tt development is based off alien technology. By dmcgrath in forum Thermaltake Mod Submittal *NOW CLOSED to new Submittals"